Kosovo is 97% reliant on two aging coal based power plants, hence accounting for almost all of Kosovo’s electricity production. Electricity losses in transmission grid for 2016 are at 1.5%. Electricity losses in the distribution for 2016 grid are at 29.7 % or 1427 GWh of total distribution demand. Source: Ministry of Economic Development, Annual energy balance of Republic of Kosovo for the year 2016. The district heating system in Kosovo is available in 3 cities, Prishtina, Gjakova, Mitrovica. They provide currently for only about 3-5% of the heat demand in Kosovo. Total installed capacity is 332 MWt. Mandatory target for RES by 2020: This target is participation with 25% of energy from RES in the final gross consumption of energy. As a signatory of the Energy Community Treaty, Kosovo is committed to meet the savings target of 9% or around 92 ktoe, by 2018. Greenhouse gas emissions in Kosovo are around 9.5 milion tons of CO2 equivalent. Kosovo has calculated a potential emission reduction of 7-14% in 2018. 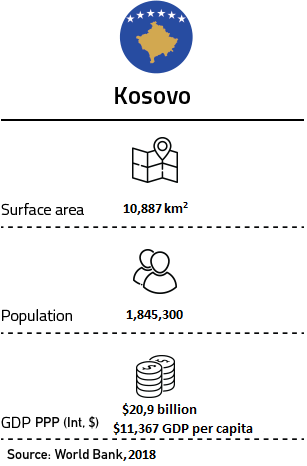 Source: Ministry of Environment and Spatial Planning, Climate Change Framework Strategy (CCFS) for Kosovo.